The project involved the demolition of a failing seawall; on-site reuse of excavated material to raise levels and its landscaping; the construction of a 500m promenade and seawall along a new landward and a more sustainable, curved alignment. The engineering challenge needed great sensitivity, not just due to it’s fragile ecology, but this stretch of coastline has held great memories within the hearts and minds of the community and made significant connections with its history. 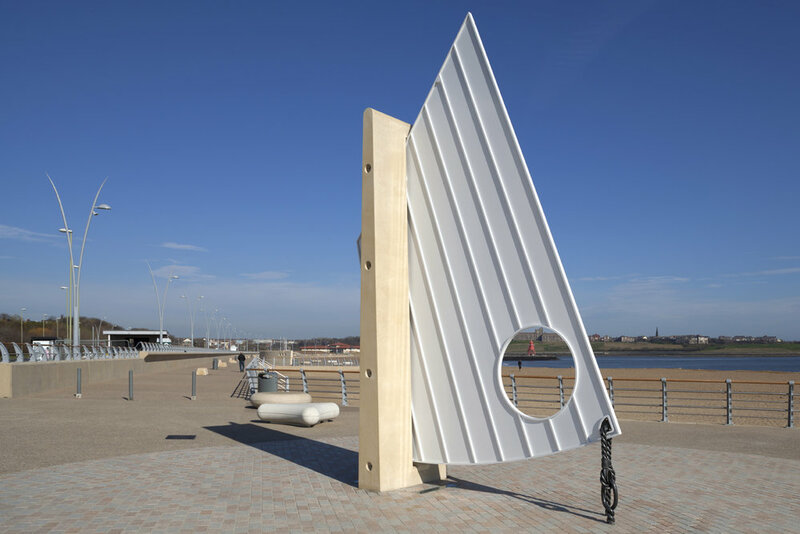 Our role as artists, together with the landscape team and engineers, was to uncover the spirit of the place, forged by generations of maritime activity, then develop ways to craft this story in a renewed landscape, that would honour their history and allow all ages to enjoy promenading in such a significant and dynamic environment. Through history, Littlehaven or Herd Bank as it was called, has been a place for watching and waiting; for guiding and rescuing; mariners arriving or leaving the North Sea at the mouth of the River Tyne. It has a remarkable sense of place, and this has been creatively expressed throughout it's history, by the poets and songwriters. We looked for ways to embed a sea shanty or folk ballad into the fabric of the landscape, and develop visual props to those words. We set about searching for the right song, that connected to the historical context and was also a song that spoke of the sea and the land, with a sense of waiting or longing. After trawling through hundreds of songs online and with the help of different museums and in particular the English Folk Song and Dance Library in Regents Park, London, we arrived at a song that worked perfectly for the space. The chosen ‘song of the sea’ text, was an old Northumbrian song ‘Blow the wind southerly’. This song speaks of watching for the safe return of the Collier sailing ships. The song has been blasted into the length of the new seawall allowing people to read the verses along the length of the promenade. 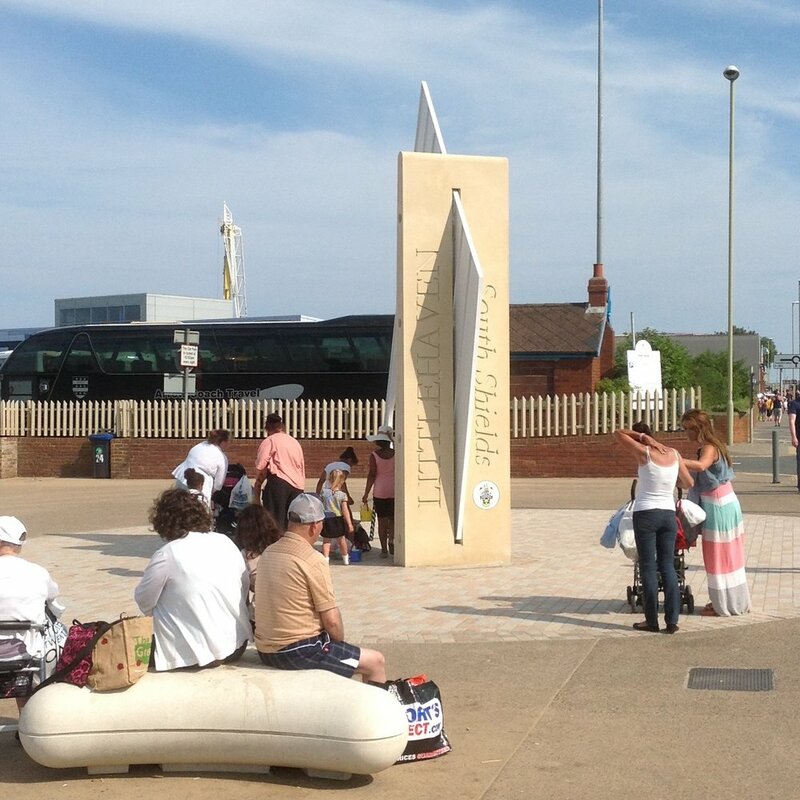 We developed the ‘Tyne Eye’ sculpture, to sit on the high point of the newly landscaped area, landward of the sea wall. The 18 ton cast concrete sculpture, evokes that sense of longing, of watching and waiting and also includes a line from the song. It serves as a fabulous seat and viewing point out to the North Sea. It has proved to be a great place for photographers. This sculpture serves as a gateway feature, drawing people to the new promenade. 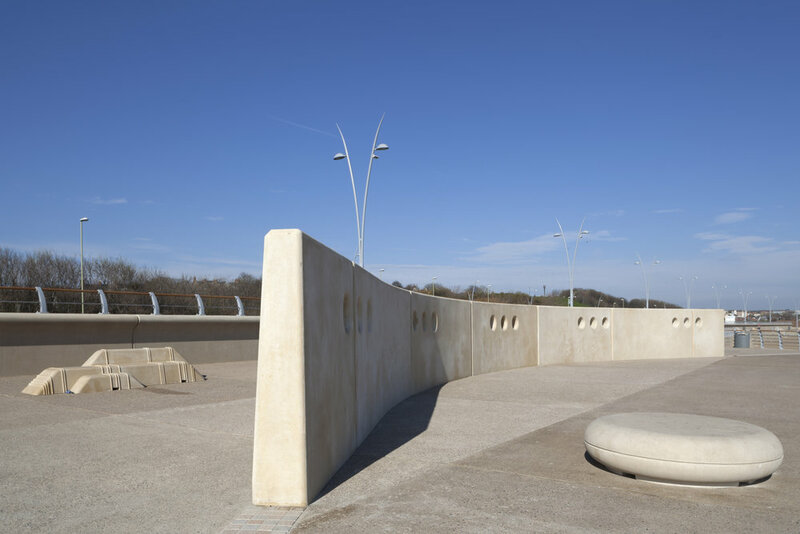 It celebrates the Northumbrian ‘Cobble sail’, in cast concrete and white aluminium, with port holes that frame views and play on scale. More subtle references to the coastal location, developed by Oobe, are reflected in the shapes of the bespoke seats, inspired by diatoms and dunes. These forms and ideas were developed further into a sculptural concept to be sited on the beach at the tide line. It would be an interactive and dynamic artwork, reminiscent of a viking boat and serving as a memorial to the many who never made it home, but were lost at sea. This has not yet been built. This is an unusual, refreshing response to coastal defence involving a landward shift in sea defences, in the interest of long-term sustainability. The judges were impressed by the sensitive and collaborative design response to an evolving coastal issue.